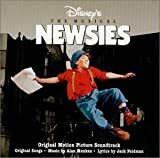 Accueil Bande originale Paroles Chansons Once and for all – Paroles de la chanson dans “Newsies”. Once and for all – Paroles de la chanson dans “Newsies”. Sortie : 10 avril 1992. Interprétée par Bill Pullman et les crieurs. This is the story you wanted to write. Well, tonight is the night that you can. Just get this done and by dawn’s early light. You can finish the fight you began. This time we’re in it to stay. Think about seizing the day. As she rolls into old Santa Fe. Tell ’em I’m on my way. See old man Pulitzer snug in his bed. He don’t care if we’re dead or alive. Three satin pillows are under his head. While we’re beggin’ for bread to survive. Joe, if you’re still countin’ sheep. Wake up and read ’em and weep. With their sticks and their slugs. Yeah, but we got a promise to keep. Something tells me the tide’ll be turnin’. There’s a fire inside me. Now that the choices are clear. Now that tomorrow is here. Watch how the mighty will fall. For once and for all. This is for kids shinin’ shoes in the street. With no shoes on their feet every day. This is for guys sweatin’ blood in the shops. While the bosses and cops look away. This is to even the score. This ain’t just newsies no more. This ain’t just kids with some pie in the sky. This is do it or die. We’ll be there to defend one another. Every kid is our friend. Five thousand fists in the sky. Five thousand reasons to try. We’re goin’ over the wall. Better to die than to crawl. Either we stand or we fall.